Actvity Summary: This investigation introduces you to the status and role of Antarctica in Cenozoic (specifically Neogene) climate change and sets the stage for evaluating the two sediment cores retrieved from the floor of McMurdo Sound by the Antarctic Geologic Drilling Project (ANDRILL) in 2006 and 2007. 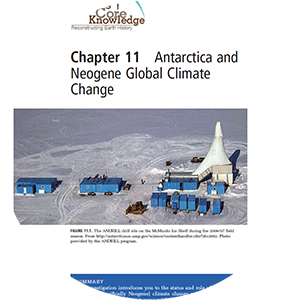 In this chapter you will build basic geographic and geologic knowledge of Antarctica and use geologic reasoning. In Part 11.1, you will review your understanding of the oxygen isotope curve, interpret global climate conditions from this curve, and assess the validity of your global interpretations based on the global distribution of sediment cores. In Part 11.2, you will become familiar with the geography and geologic units of the Ross Sea region of Antarctica and review or build your knowledge of southern hemisphere seasons, sea-ice, ice-shelves, and the challenges associated with obtaining a sediment core from the floor of McMurdo Sound. You will also build and use your understanding of simple geologic maps, cross sections, and the geologic time scale, so you can explain the reasons for selecting drill sites in McMurdo Sound. In Part 11.3, you will review the existing data from sediment cores in the Ross Sea region of Antarctica and use the knowledge gained in Parts 11.1 and 11.2 to identify a target stratigraphic interval and select two drill sites. Evaluation of the ANDRILL core is undertaken in Chapter 12 “Interpreting Antarctic Sediment Cores”.